Red wine from Jumilla made from a blend of Monastrell, Syrah, Petit Verdot and Cabernet Sauvignon and aged for 15 months in oak barrels. Red wine from Jumilla. Varietal Monastrell aged for 12 months in French oak barrels. Red wine from Jumilla made from Monastrell and Syrah aged for 5 months in oak barrels. Red wine from Jumilla. Old-vines Monastrell, Cabernet Sauvignon & Syrah aged for 18 months in French and American oak barrels. 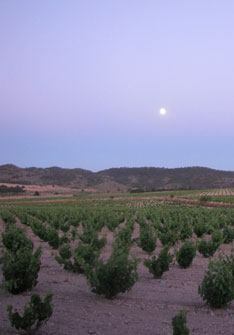 Young red wine from Jumilla made from Syrah, Monastrell and Grenache.